Proper fielding begins before the ball is even hit. You should always be in the "ready position" before a pitch to have the best chance of making a play. Lean slightly forward, with your knees bent and your weight on the balls of your feet. Your glove should be low and ready for action. Your feet should be a shoulder-width apart as you watch the pitch. When a ground ball is hit you, square up with chest facing the ball. Stay in front of the ball and look it into your glove. 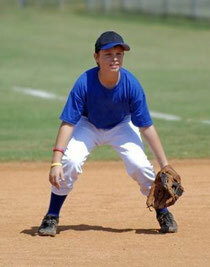 By being in front of the ball, you will be protecting against the bad hops that ground balls often take. You'll be able to knock the ball down with your body and can still make a play. When the ball is hit in the air, run to a spot slightly behind where the ball should land. Keep your eyes on the ball until it is all the way into your glove and use two hands to make the catch. Once you field the ball, take your time before making a throw to the proper base. Face the person you are throwing to and set your feet to make an accurate throw.